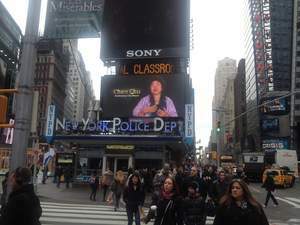 KAOHSIUNG, TAIWAN--(Marketwired - Mar 20, 2014) - Kaohsiung City Mayor Chen Chu has extended an invitation to foreign friends for visits in her "incredible" city through a commercial launched in the Times Square in New York earlier this week. The video also features members of Taiwan's top pop music group, Mayday, who are Global Ambassadors of Kaohsiung -- a port city in southern Taiwan known for its hospitality, dynamic lifestyle, and the splendor of art and culture. Against the background music that Mayday composes for the city, the "Incredible Kaohsiung" video presents the beauty of scenery, the unique modern architectural designs, and richness in cultural heritage of this industrial metropolitan. According to Kaohsiung City Information Bureau, the video has won tremendous popularity among the Taiwanese public and it was voted by netizens the best commercial in the 7th annual competition organized by PTT. The Kaohsiung City Government expects the commercial, launched in New York March 18, to attract extensive international attention to the city amid strong promotion of Mayday, which is also planning concert tours in US and Europe later this year. Mayday has been a sensation in Chinese communities worldwide. Its members each represents one of the five key tourism development highlights offered by Kaohsiung. In the video, the rhythmic music it composes reflects the passing of time and transformation of Kaohsiung from a shipping hub to a world-class city of charm and grandeur. It has also become a favorite venue for international events in recent years. In easiness and relaxed mood, Mayday vocalist Ashin guides a tour in the city. Group leader Monster introduces the beauty of modern art. Bass guitarist Masa enjoys a boat ride on Kaohsiung's signature Love River, while lead guitarist Stone recommends cycling as a means to feel the city's vitality. Drummer Guan-yu visits Meinong Town, a culture center of the ethnic Hakka people, to appreciate the art of making traditional paper umbrellas with exquisitely designed materials. Songs and dances of the indigenous people in colorful costumes are also featured to showcase the cultural heritage. Kaohsiung offers highly diversified scenery, ranging from Yushan, the highest mountain in Taiwan, to unspoiled coast lines and the majestic Love River. Home to 21 wetlands, Kaohsiung values conservation of the environment and has been the recipient of a number of international awards. With comfortable climates in all four seasons including up to 300 days of sunshine a year, annual average temperature of 24 degrees, minimal temperature difference between day and night, Kaohsiung is an ideal city for sightseeing. Photo caption: Kaohsiung City Mayor Chen Chu and Taiwan's top pop music group Mayday promote Kaohsiung through a commercial launched in the Times Square in New York.